Not long ago, I met with a senior executive of a large U.S. corporation to discuss the topic of accountability and how to hold his team accountable for the results they committed to achieve in 2015. We also talked about the difference between task accountability (for example, achieving financial metrics) and personal accountability (how I act). Both are critically important in today’s workplace. My client became quiet and sat thoughtfully for a moment. He then looked at me and said that several months earlier he seriously considered having an affair with one of his direct reports. In a brief conversation late one afternoon at the office, she made her interest unmistakably clear. Things were a bit rocky at home at that time, and he struggled with whether or not to accept the invitation. He told me that he finally came to his senses and steered clear of a certain disaster. "I understand that both types of accountability are important, but personal accountability is not something we talk about here. It would have been great to have someone tell me I was crazy for even considering the invitation and to get my head on straight." 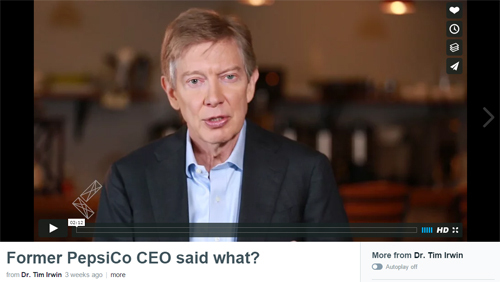 Watch the video below to hear how one of the best CEOs in the last 20 years handled the subject of accountability. Copyright 2015. Dr. Tim Irwin and Irwin Inc, LLC. All rights reserved. Excellent observations on the dramatic need for accountability in all compartments of life! The idea that any one of us can increase in power and authority without moving toward arrogance and pridefulness is a fantasy. I remember what a certain theologian said, "All power corrupts and absolute power corrupts absolutely!" Not a bad thought to consider during this time of political circus!